J.M. Snyder » Heat Wave: Wildwood is now available! 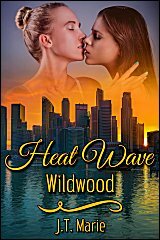 Heat Wave: Wildwood is now available! My latest lesbian romance writing as J.T. Marie, Heat Wave: Wildwood, is now available! When Tara receives a wedding invitation from a cousin she hasn’t seen in years, she knows it’s nothing more than a bid for a gift or money. But Amanda lives in Wildwood, New Jersey, where Tara used to spend her summers as a child, and a much-needed vacation down the shore sounds like the perfect way to finish off a hectic summer. Every hotel in the tourist trap is booked, though, so Tara’s Aunt Marlene invites her to stay with them the week of the wedding. But Wildwood isn’t quite the island paradise she remembers from her youth, and both her relatives would rather get drunk than have fun on the boardwalk. Plus Marlene is determined to set Tara up with a coworker of hers even though Tara isn’t interested — in men or in romance. The vacation is beginning to look like a bust until the night of Amanda’s bachelorette party, when Tara meets Delaney, a pretty bartender with fiery curls and a personality to match. Suddenly the summer heat isn’t the only thing making her sweat. Can Tara salvage what’s left of her time in Wildwood with Delaney’s help? Or will family obligations keep her from following her heart?